As I announced in this post, I hosted Easter Sunday dinner for my family this year and... it was successful! I was pleased how it turned out plus my mom and grandmother raved about it. With a lot of preparation, I was on time with almost everything, but just not early, so I rushed to snap the following photos that I wanted to share with you. 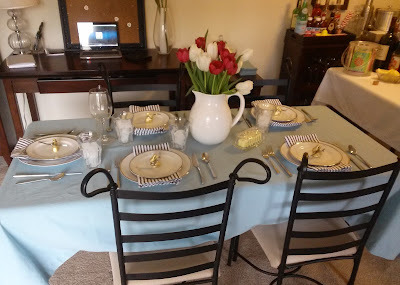 First, I wanted to show how I set the dining table. I made do with a yard sale-type table and light blue tablecloth, both of which I borrowed for the occasion. Pastels are not my favorite. The silverware is missing in the photo below as I borrowed forks, knives, and spoons from my mom when she came over at dinnertime. 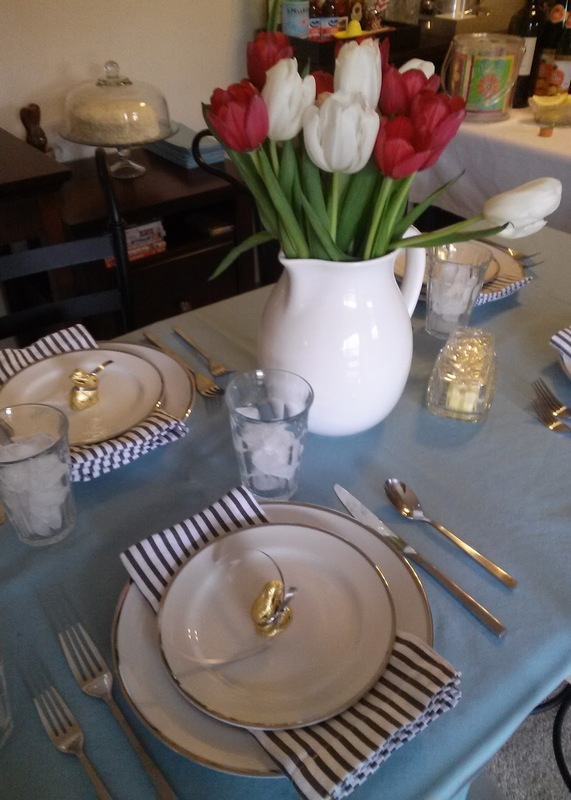 As a centerpiece, I arranged gifted dark pink and white tulips from the grocery store in my large white pitcher from HomeGoods. I will do a shorter bouquet next time. This is the view from my seat at the end of the table. The glasses for tea are from Ballard Designs. The wine glasses and the striped cloth napkins are both from Crate & Barrel. The dark gray stripe of the napkin goes with the platinum rim of the plate at each setting. Specifically for this dinner party, I ordered these elegant dinner and salad plates from Pier 1. They are beautiful. In fact, I plan to order more to achieve service for either six or eight. Inspired by Pinterest, I matched the platinum trim on the dinnerware with a dark silver ribbon from Target. 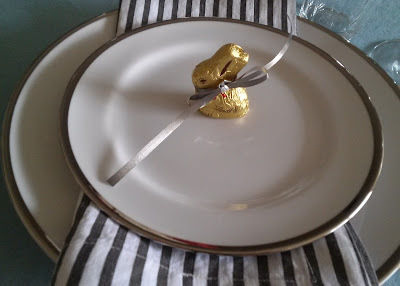 I cut the ribbon in half lengthwise and then tied a bow around the neck of each mini gold-wrapped Lindt milk chocolate bunny, which I also picked up at Target. I love that I decorated with chocolate! I also carried on the silver theme in my kitchen with this garland. This was on clearance on an endcap at Target. I wish I had purchased another! I chopped the end off the garland so I could pin a bit of it to my corkboard on my desk. From this office area, an Italian dinner music CD played from my laptop and external disk drive. Before it was time to eat the salad course, I added the flatware to the table and ice cubes to the glasses. 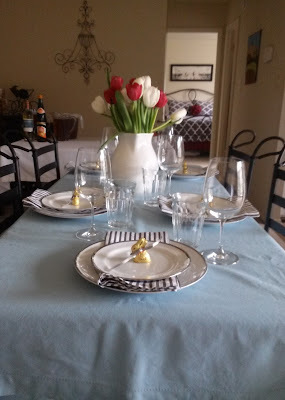 Most of the wine glasses are missing in the image below since I offered each guest a drink promptly after arrival. We squeezed in. I had a dining table and a separate food table. I served everyone food myself. 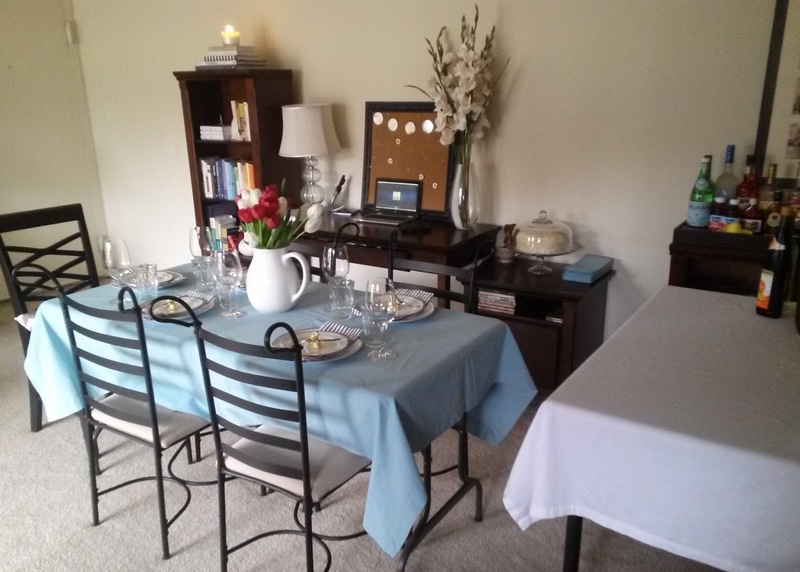 The dining table was in a space in between my dining room and my living room, next to my office area. With all the furniture, space was tight. Again, I also made do. For example, one chair didn't match my set of four. 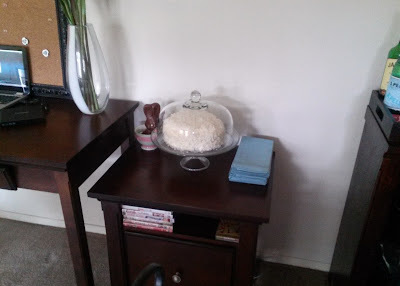 I even used the printer stand to display the coconut cake and a chocolate bunny. The cake dome and stack of light blue cloth napkins were borrowed. 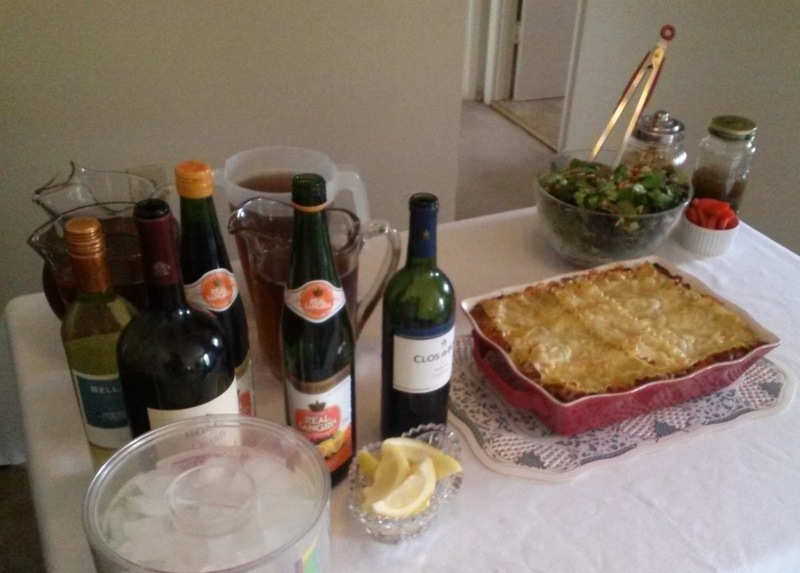 Pitchers of tea, bottles of wine, a bucket of ice and a dish of lemon wedges are featured on the left. Salad, seasoned croutons, homemade balsamic vinaigrette, a Crate & Barrel ramekin of red bell pepper pieces and a large lasagna on the right. I borrowed the ice bucket and glass dish since my parents brought the ice and lemon for them. I actually own an ice bucket though, acquired back when I had a "hope closet" (rather than a "hope chest"). Under the hot lasagna dish, I also used my mom's placemat, but I do have my eye of a set of three trivets for use in the future. This is the meat lasagna right out of the oven less than a minute before my guests arrived. It cooled while we enjoyed appetizers and the salad course. Perfetto. The recipe is from theKitchn. It was delicious! I made it with "sweet" sausage which I learned is the same thing as "mild" instead of the usual hot variety in order to suit my mom's preference. 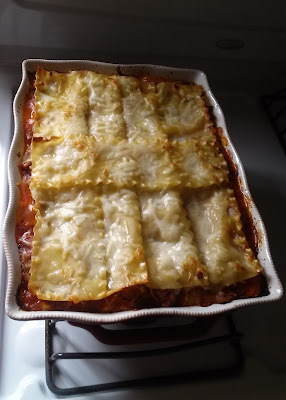 This time, I sprayed the aluminum foil with cooking spray so it wouldn't stick to the top cheese layer like Jennifer of The Daily Connoisseur recommended. I purchased all the food at my local grocery store and it was great, but I would enjoy shopping at a premium place like Fresh Market in the future. 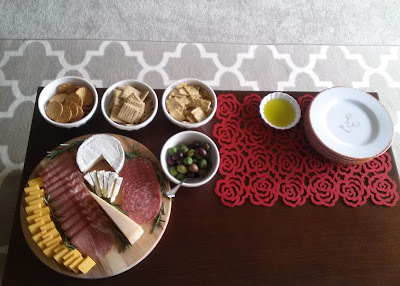 First, I served my guests antipasti on the coffee table. This was a big hit. On the cutting board, I have a selection of three cheeses: a soft: brie, a semi-hard: sharp cheddar, and a hard: parmesan. I also included some charcuterie: prosciutto and soppressata. The brie and parmesan had their own knife. I garnished the round board with a few sprigs of rosemary. My four Latte Bowls from Anthropologie are filled with: Harvest Wheat Toasteds, Hint of Salt Triscuits, and Italian Herb Town House Flatbread Crisps, and mixed marinated olives. The little scallopped Pier 1 dish of olive oil is for the sourdough bread in a tall black wire container that I never managed to take a picture of. I had to slice it. Also not pictured are the meatballs that my dad made on behalf of my mom. 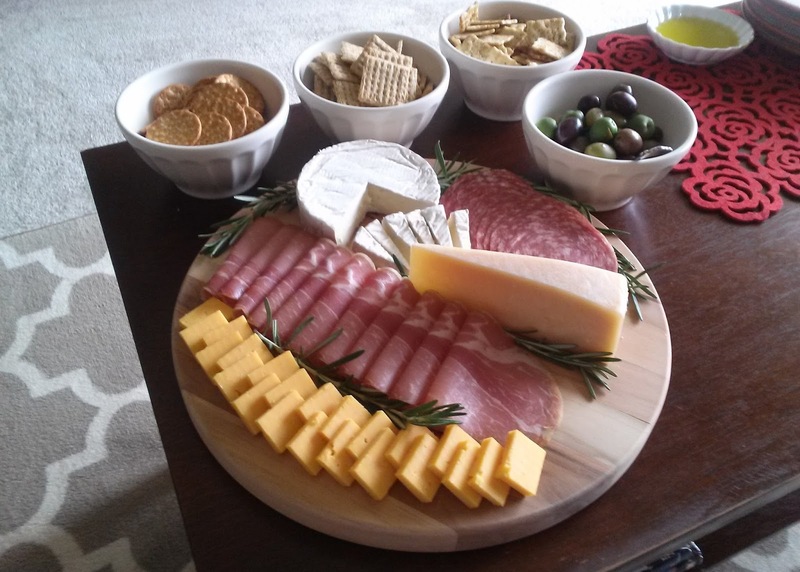 I love bringing out this set of four appetizer plates. Each plate features the word "cheers." One is in English and other three are in foreign languages. It was a gift from a friend years ago. 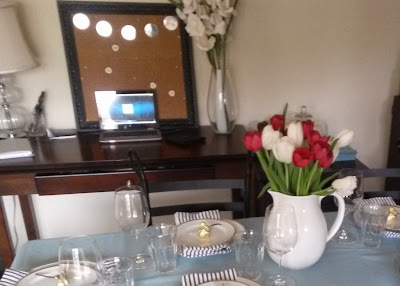 This rose cutout placemat also from Pier 1 is a go to for entertaining as it always seems to coordinate with my (red) dining placemats. Now, I wish I had bought more than one! 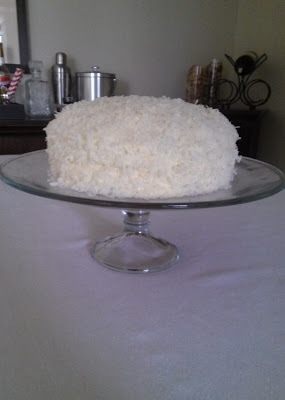 After the meal, I served a coconut cake for dessert. I quickly whipped it up using a box mix and canned frosting that morning. This is Betty Crocker yellow cake and buttercream frosting. I centered it on my cake stand, but I need to buy a dome for it. 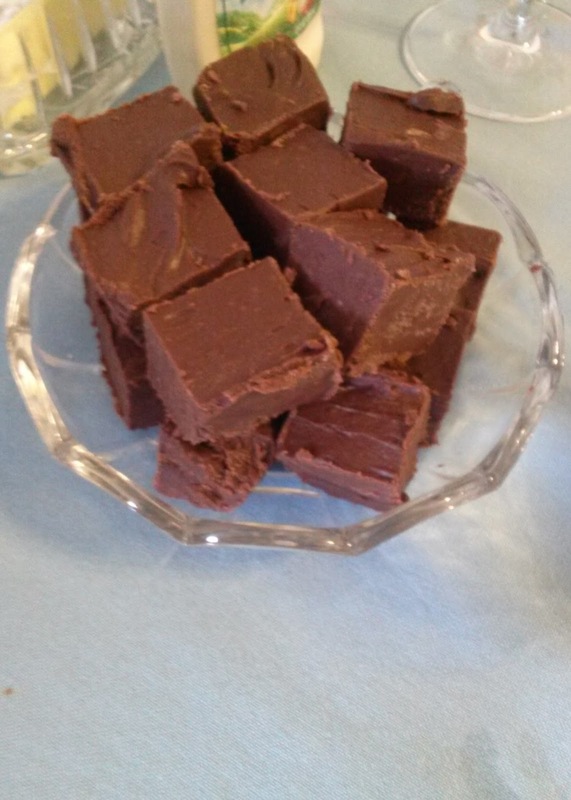 I wanted this dinner to be successful, so I made my grandmother's favorite, homemade chocolate fudge. She was blissful. I made this dessert three nights prior, but cubed it that morning. This is a really quick photo of pieces placed in a borrowed glass dish. I requested that my mom bring fruit for dessert. 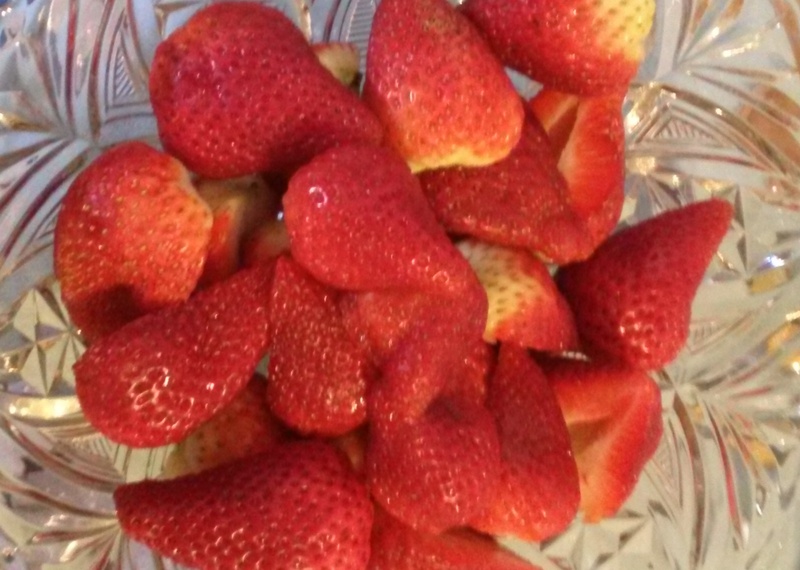 At the store together, we decided upon strawberries. I didn't have time to cut these large strawberries before dinnertime, so I quickly halved them just before dessert. I should have taken the time to cut more of the parts that were not ripe away. They are in another borrowed glass dish. My mom is an antique dealer and I share her love of clear Depression glassware. 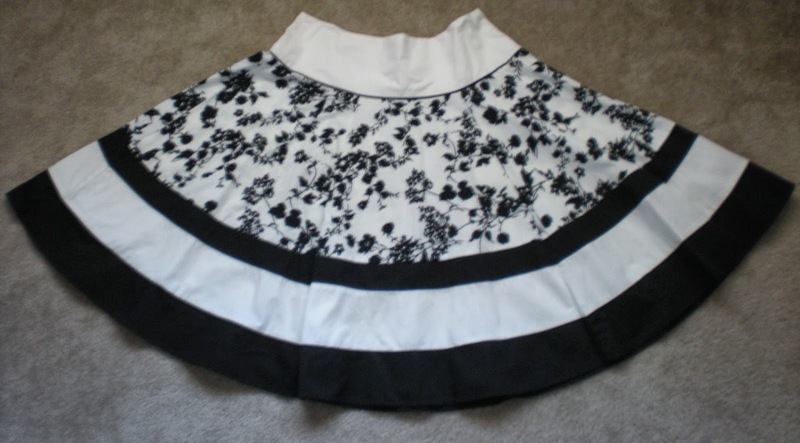 I wore this full floral skirt, perfect for spring entertaining. I paired it with a simple black tee. As intended with a New Year's resolution, I anticipate entertaining more frequently this year. 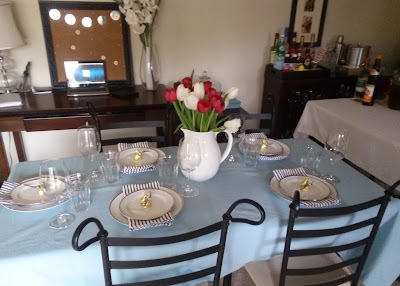 With this particular dinner party, I have convinced myself that I am ready enough to throw myself into the mix of seriously helping with large family gatherings, whether it be hosting again, hosting a potluck meal, always contributing a dish or two to another host, or helping to cook and decorate at the home of a family member. In becoming the hostess with the mostess that I dream of, this was a step that I needed to take. 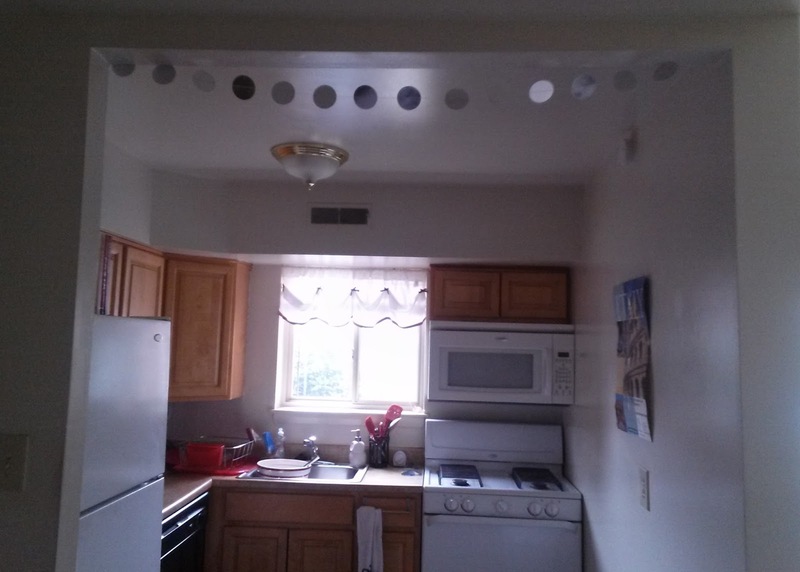 Also, I hope this post inspires someone to have people over. If I can do it in my home, then you can too. It all looks so welcoming and festive, yet tasteful at the same time. I love the little details. I am sure all of your guests were impressed with your efforts. And your house is so nice and clean too. Grazie! I think they were. I think the fact that my home is straightened and clean carries a big impact on guests. So pretty!! Really. I love the plates and settings and the antipasto looked yummy! Is there anywhere near you or in Philly that sell the Italian 'colomba'? That might be a fun touch in coming yesrs for dessert. Thank you so much! I think that they would definitely have colomba in Philly, but also in the nearby city of Annapolis. I might even be able to find them in my suburban grocery store nowadays. Thanks for the idea! It looks so lovely and elegant, Michelle! You did a fabulous job! Bravo! Such perfection in the details of your entertaining. And not so overwhelming but just wants you to open up your place more to host. Love love! I love this, it looks and sounds great! You really have an eye for details when entertaining. Such a wonderful spread! Beautiful! This is why I love your blog! It's so accessible and realistic. Most blogs seem to be ran by perfect heiresses who have formal dining rooms and butler's pantries, but you really show that the average gal really can live in luxury! Just how you arranged the cheddar shows that when we pay attention to the little things even cheese from our local grocery can be indulgent. I'm putting my kettle on and making some loose leaf tea in a vintage cup, instead of microwaving water in my normal mug and throwing in a tea bag. Your comment means a lot to me because I value authenticity and that I'm inspiring someone. Thank you.